YAY! I'm back to working one job instead of two! YAY! It was extremely relaxing and grounding to focus on my own things. I hope the feeling lasts through the week. The weather here has been crazy. Yesterday it was +7C and pouring rain. Today was -14C and we had blizzard like conditions in the morning. It's incredibly strange. To me, it seems to prove global climate change since our weather patterns are changing and becoming very unusual. 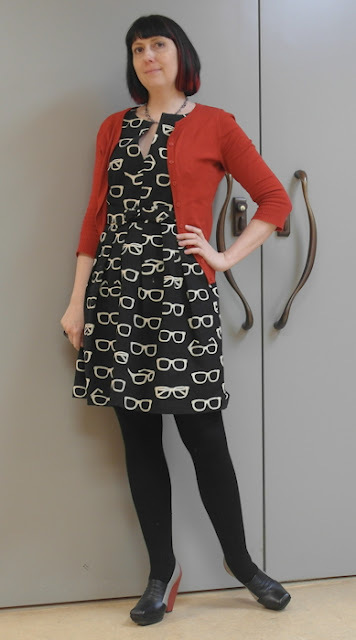 I wore my hipster glasses dress with decidedly unhipster shoes. Since the new Acting Director started today I thought I'd wear my tallest shoes. Psychologically trying to make up for my "failings"? Maybe. They also work pretty well with this dress. Speaking of happiness, these just showed up on the Fluevog website. GHU!!! I believe fluevog has the most interesting shoes I have ever seen. I wish I could afford some of them. I'm stuck with flats because of back problems but they are such works of art. I saw those new Fluevogs in the Flueblog (many previews of new shoes there!) and have been thinking about them! We're heading over to Van in March, so I may have to try those on! Love your dress. So, so cool. Great dress, I love all the glasses on it and I'm in love with all of your shoes. They are a bit too pricey for me but I really enjoy seeing how you wear them with your lovely dresses. The weather here in South Florida was a bit insane this weekend as well. OHWOW, that's just mean Mr Fluevog, those are gorgeous boots. However your pumps are pretty goshdarn gorgeous too. Love your outfit! Dress is killing me. Headed to store tomorrow, hope they have those new ones in stock! Your shoes do go well with the dress - they're pretty awesome!! Glad you are back to just one job, I know how stressful it can be! Cool shoe and dress combo! You guys have been slammed with storms out there this week. The weather has been all over the place here too. Spring one day, frigid temperatures and snow the next. Yep, we've wrecked the planet thermostat. GHU = ... "gotta have um"? It's never fun working two jobs, so I'm happy for you that you're back down to one!